At the heart of Richmond Center, Prado is Richmond's newest Luxury complex conveniently located just across from Lansdowne mall and Skytrain. Very close to Kwantlen College and just steps away from hundreds of shops and restaurants with both Parker Place and Aberdeen Centre close by. There is also excellent access to local schools & community amenities. With the introduction of the new Canada line Skytrain route, downtown Vancouver and YVR airport are just minutes away. A new hub that is central to everything Richmond and Greater Vancouver has to offer. Interiors: Spacious, 1071 sf + large outdoor balcony, 10th floor 2 bedroom, 2 bathroom with in-suite storage area. 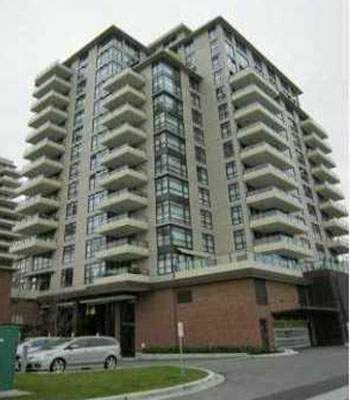 Corner suite with huge north/west facing covered balcony overlooking Lansdowne Road and onset mountain Views. Hardwood floors floor to ceiling windows & an electric fireplace compliment the living area. Open kitchen with granite counters, stainless appliances and extra deep 1 ½ drop-in sink. Ceramic tile and flush stone slab counters in the bathrooms. Carpeted comfort in the bedrooms. Master bedroom features ensuite ¾ bathroom, large walk-in closet + large mirrored closet with sliding door; a couples dream! High end polished chrome finishing's throughout. Gas cooking; gas & hot water included. Be the first to live in this exceptional suite!